Tattooing is undeniably a traditionally male-dominated profession. Ink has always been a symbol of manhood and masculinity. And until recently, lists of the best tattooists were often almost exclusively male. There have been exceptions, like Kat Von D, the artist and entrepreneur who featured on the show LA Ink that premiered back in 2007. And I-D Magazine recently highlighted female artists breaking into the industry—while reminding us that only one in six tattooists in the industry is female. The artform in Vietnam is much younger than in the States and Europe—most artists remember the very real recent struggle to pursue their passion in the face of prejudice, including the young female artists and studio owners we’ve sought out here. And tattoos definitely don’t fit the traditional view of feminine beauty. At Vietcetera, we’ve frequently encountered the entrepreneurial Vietnamese spirit. It’s an energy that’s strong in tattooing right now. Four out of five of our artists have their own studios—the other is an artist at Saigon’s most successful tattoo shop. And all five are under the age of thirty. 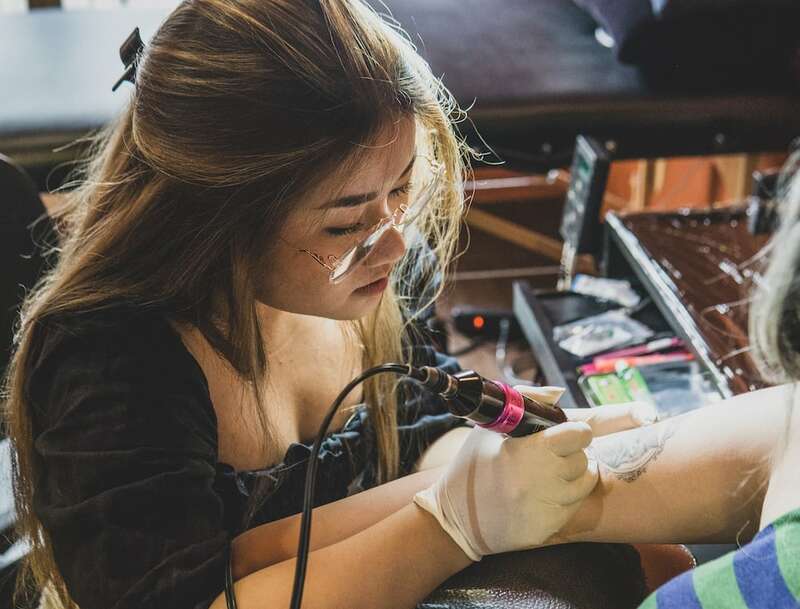 So, these are our five female Vietnamese artists diversifying the Saigon tattoo industry here. 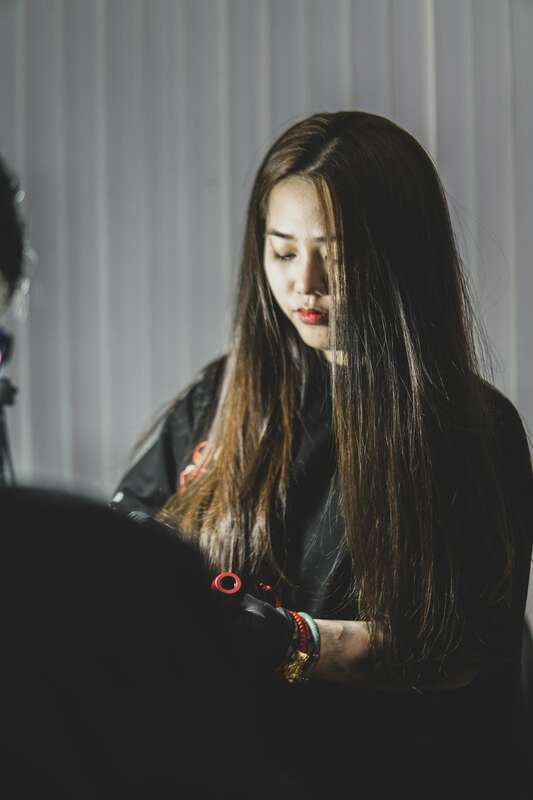 “Wow, I really feel like a boss being photographed in this chair,” Cô Giáo Tattoo Studio’s owner, Tram Dinh, jokes to her three tattooists and a student who’s come over to study. But with two tattooed sleeves and a thick gold chain around her wrist, she does look like the boss—despite only being twenty-three. Cô Giáo Tattoo Studio’s owner, Tram Dinh. Her black line work was inspired by local artists like Lam Viet, Tu Den, Quang Pham, and Nguyen Thanh Cao, and international artists like Victor Chil, Steve Butcher and Paul Acker. “But I had no support from family or friends at first. However, now many of them come to me for their first tattoos. That makes me want to keep striving to make more people know about me and give this art form greater recognition in Vietnam,” she smiles. Hang Kim Tran, the owner of Finical Tattoo Studio in District 3. She’s noticed the difference since starting her independent studio. 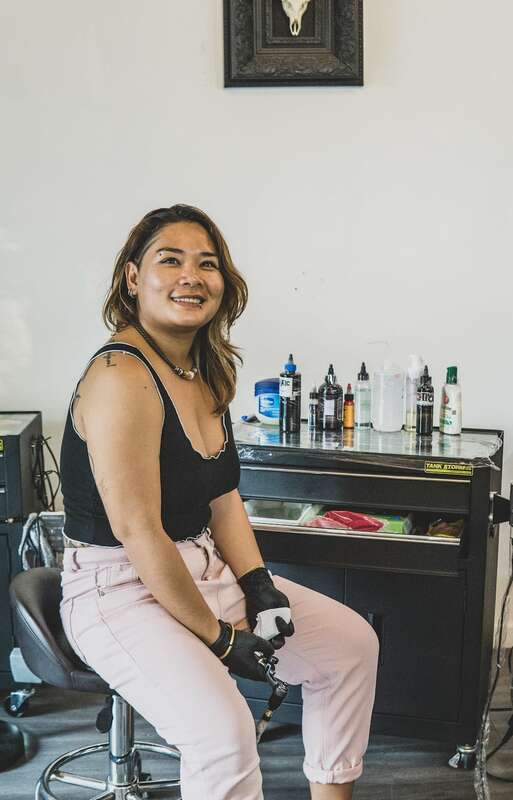 “My job was straightforward before,” Hang laughs, “come to work, tattoo, and go home..” As the owner of her own store she “has to handle so many things—staff, rent, social media.” But she’s happy to be independent. “It seems everyday I learn something new,” she smiles. 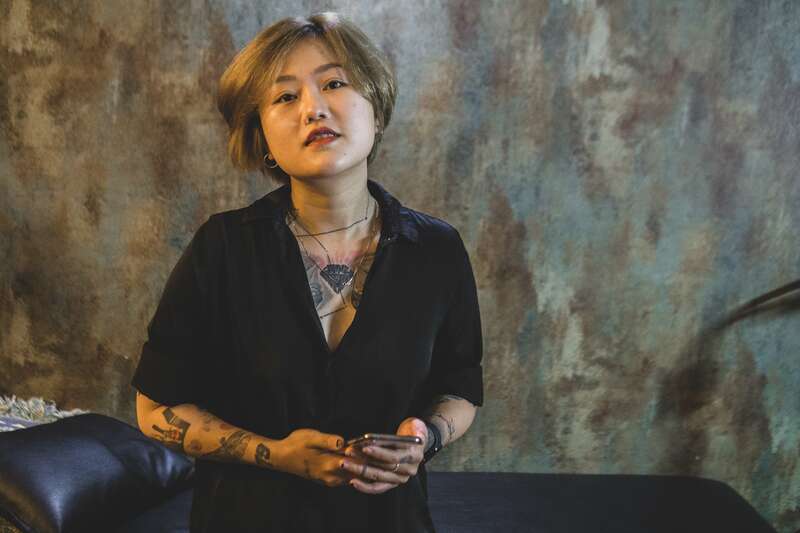 “I’m forgetful so these tattoos are my way of remembering,” tattoo artist Le Bao Tram tells us about the sixty tattoos she has already. Tram runs Olive tattoo, a one-room studio at the end of a winding alley off Nam Khi Khoi Nghia that’s staffed by herself and three other artists. “This studio is like a cherry on the cake of my tattooing career—a poor person like me from a rural area could come to the city and achieve this,” she smiles appreciatively looking around at the immaculate space. Le Bao Tram does fine black-line portraits—of people and pets—and watercolor-style tattoos. 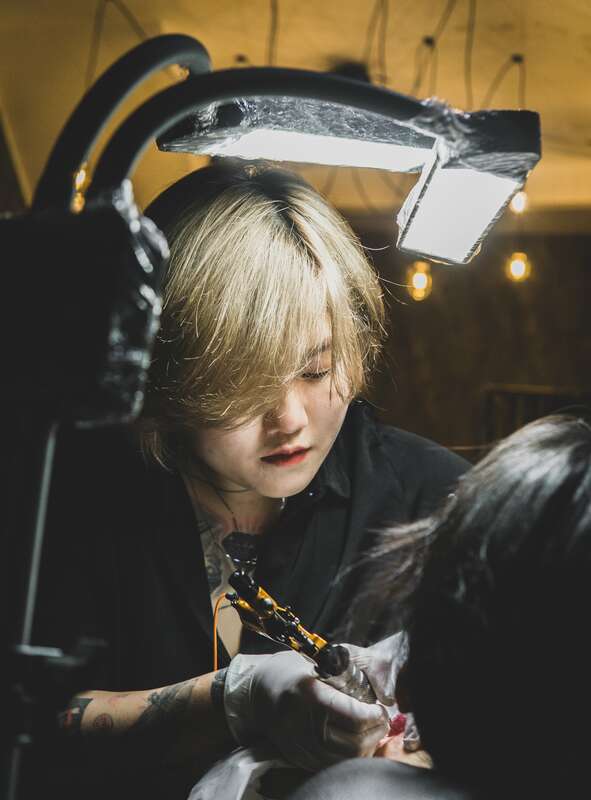 She began by apprenticing for two years under a tattooist in Saigon and gradually gained the confidence to start tattooing herself. “I practiced on my own skin,” she nods, “but I can’t really remember the moment I became a professional tattooist—people just started asking me to tattoo them.” And that was five years ago already. 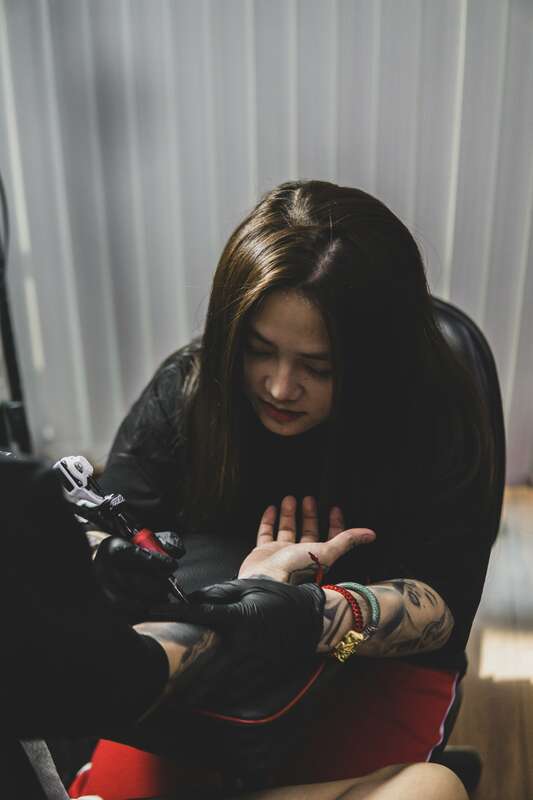 Minh An Phuong is the only female artist at the perennially popular tattoo studio Saigon Ink in the city’s backpacker district. “How do I put this?” she laughs self-consciously, “it’s hard being the only female here…but it makes me feel kind of special.” She credits the studio, and its artists, with teaching her about tattooing and about life in general. “It’s changed not just how I tattoo, but how I think too…” she explains. Minh An Phuong is the only female artist at Saigon ink. “And today, girls can do anything they dream of or desire…” she shrugs finally. “Growing up tattoos equaled outcasts or gangsters,” Fiona Pham remembers. Her family had the same view and were ushering her towards a career as a pharmacist. “But all I wanted to do was draw,” she shakes her head. Fiona Pham, owner of Inkkredible Saigon. 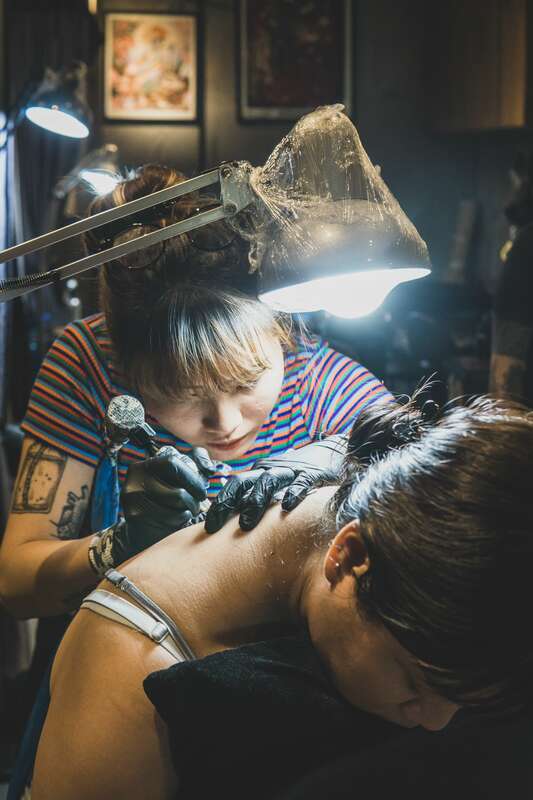 While at university on her track to becoming a pharmacist she took a part-time job at Recycle Bin, one of the original studios in Saigon’s tattoo scene. But when her parents saw one of her first tattoos—a line of letters on her shoulder—they refused to let her return home. “But I didn’t get rid of the ink, I got rid of them, temporarily anyway, and moved out,” she continues. There’s the positive atmosphere in this studio you get being around someone doing what they love. “I can’t imagine doing anything else except this,” she smiles as she begins work on another tattoo.